This is the second part of our 3 parts serie about macronutrients (read the first part about proteins here). What are lipids used for? 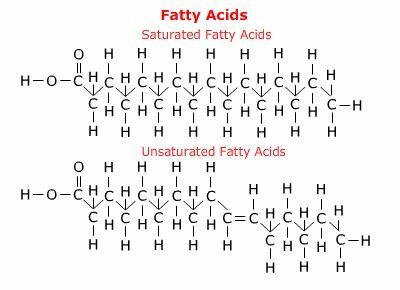 We usually distinguish the saturated fatty acids (which don’t have not any double bond), the monounsaturated fatty acids (which only have one double bond) and the polyunsaturated fatty acids, which have at least two double bonds. Fatty acids are usually stored as triglycerides within the fat cells (adipocytes), which are the main source of fat. Every fatty food contains in different proportions saturated, unsaturated and polyunsaturated fatty acids. These very same proportions will likely determine the physico-chemical properties of a fatty food. These proportions modulate the mixed melting point : a fat, high in saturated fatty acids will be more resistant to high temperatures than a monounsaturated fatty acid, that last being more resistant to the polyunsaturated fatty acid. For instance, the butter, high in saturated fatty acid is solid around 20 degrees, while vegetal oils, high in unsaturated fatty acids are liquid at the same temperature. Lipids, being hydrophobic (they do not dissolve into water), are being transported within the bloodstream by protein structures called apolipoproteins – the gathering is called lipoproteins. The more a lipoprotein contains triglycerides the less it is dense, and vice versa, the more it contains apoproteins, the more dense it is. The chylomicrons are formed within the small intestine, and they mainly carry triglycerides (being synthesized from dietary fatty acids) and a small amount of cholesterol. They first circulate within the lymphatic stream, the blood stream. Once they reach the plasma, the triglycerides are hydrolyzed by the lipoprotein lipase (an enzyme that catalyzes the fats) – making those fatty acids available for the peripheral tissues OR they are drained by the adipocytes where they are converted back to triglycerides. The more the hydrolyze moves on, the more the chylomicrons shrink; while their excess material is being transferred to the High density lipoproteins that move around. In the end of the process, the only thing that is left are remnant chylomicrons, which contain less triglycerides than cholesterol. Those are destroyed within the liver. Chylomicrons move into the blood stream around one hour after a meal, and disappear after 8 to 12 hours. Lipids have also an endogenous origin: from glycerol and from the free fatty acids, that are released by the liver or adipose tissues. The liver is able to synthesize fatty acids as triglycerides (Very Low density lipoproteins, along with cholesterol). 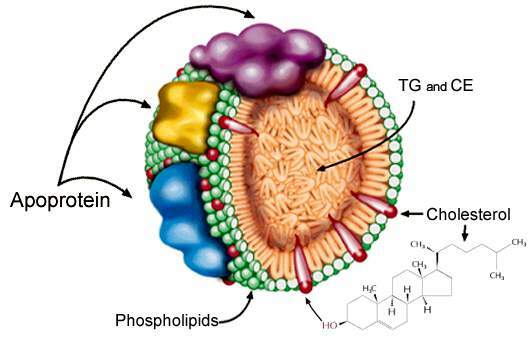 The triglycerides which are produced are also hydrolyzed by the lipoprotein lipase, and again, the different tissues drain the circulating fatty acids, and the lipoproteins shrink (since we have less triglycerides and more cholesterol), turning them into Intermediary lipoproteins. Neo Lipogenesis (which is the fatty acids synthesis from glucose or amino acids) rarely occurs, it’s only the dietary fatty acids which are stored within the adipocytes. In excess, a neo lipogenesis ~might~ occur, but the process being much costly, that doesn’t usually happen (around 20% of the energy is used for the conversion). The polyunsaturated fatty acids are useful in regards to cell movements and deformations; for instance, erythrocytes (red globules) can only penetrate capillaries because of the fluidity of the membrane. 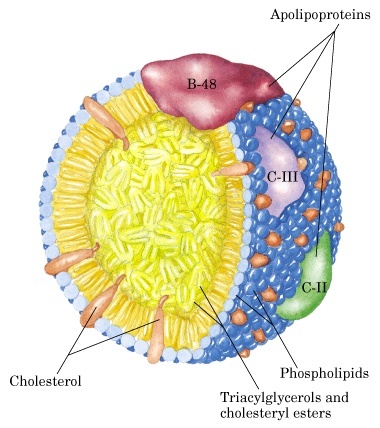 Cholesterol and phospholipids proportions that can be found within the cell membrane, and their composition in fatty acids have a direct influence on the membranes proteins (such as enzymes, transporters or hormonal receptors) but more importantly such composition for the phospholipids is determined by the dietary triglycerides availability. In other words, the fats you consume modulate the phospholipids composition. For instance, the more polyunsaturated fatty acids you eat, the more insulin receptors you’ll have (or a better stimulated activity) – in the opposite, being deficient in omega 3 polyunsaturated fatty acids will impair the insulin-receptor complex. By consuming fatty acids, especially polyunsaturated omega 3 fatty acids, you could prevent the insulin resistance. Mitochondrial membranes are also rich in polyunsaturated fatty acids, while the omega 3 seem to play an important role in the proteins involved with the electrons transportation performance; free radicals, made by electrons leaks, can occurs with defectuous membranes. The brain is the organ where polyunsaturated fatty acids are the most abundant : 60% of the phospholipids are composed of Arachidonic and Docosahexaenoic acid (DHA). Some experiments on animals showed that the consumed fatty acids, let’s say saturated fatty acids, can modulate some genes, especially proto-oncogenes (genes that turn to oncogenes; genes which expression promotes cancers development). Some other interesting studies have discovered a link between breast cancers, prostate cancers (“crossed cancers”) and an unbalanced omega 3/omega 6 ratio. From 1950 to 1990, breast cancers went from 18 to 28% for 100 000 women death, and for 100 000 men, death by prostate cancers went 15 to 30%. Omega 3 could prevent breast cancers metastasis rate. On a daily basis, men consume around 20 different fatty acids from both animal and vegetal sources, some though are fragile: sun/ light/ air could change their composition. The most exposed are the long-chain polyunsaturated fatty acids; some of them are also purposely altered in order to update the thermal resistance of the fatty bodies. The more an acid is polyunsaturated, the more it is liquid on ambient temperature, but at the same time, the more it sensible to light and air oxidation – and the less it resists to high temperature. In the opposite side, saturated and monounsaturated fatty acids resist to oxydation at high temperatures. Make sure not to expose polyunsaturated oils to light and air. Olive oil contains chlorophyll, making this last even more sensible to light. Truth is… every oil oxidizes in one or other way. For instance, a closed bottle of oil would go from 50 mcg to 500 mcg in six months only ! Not to mention that self-oxidation is increased when the fatty bodies met air/ light; and even more when the air volume within the bottle increases by its usage. The cooking of those fats can be enhanced by adding several foods. For instance, by adding oinions, you prevent lipoperoxydation (thanks to their antioxidant properties). Nevertheless, it is always a bad idea to cook oils at high temperatures, and both fried and fumed oils are unfit for human consumption. For instance: the oil used for french fries, when left to ambient air, becomes unfit after 4 or 5 usages only. Under 180°, sunflower, soya, and colza oils keep their properties – but even if those oils can be warmed, they cannot be fried if you want to prevent their lipoperoxydation. Nut oil can only be used for uncooked preparations. 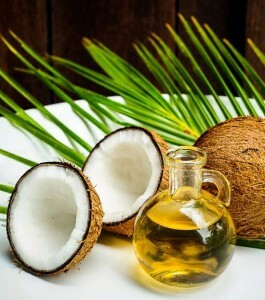 As for the solid fats, they could either come from copra (coconuts), palm oil, and even sometimes animals suet (lard). The solid state and the resistance to high temperatures would be impossible without a “solidification” process : an this is the hydrogenation the food industry uses. The hydrogenation is the saturation of the hydrocarbonated chains of the polyunsaturated molecules with hydrogen – making these oils solid (more or less saturation of the multiple double bonds). 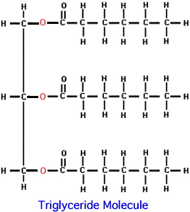 In the end, the original polyunsaturated chain turn to a more monounsaturated/ saturated chain. The hydrogenation changes in the end both composition and position of the multiple double bonds that compose a polyunsaturated chain. If we take for instance some sunflower-made margarin; you end up with around 30% of polyunsaturated fatty acids, while sunflower oil contains around 65% of polyunsaturated fatty acids. As for the saturated acids ; well you go from 13 to 50% in the end for that same oil ! The only interesting thing about margarine made from sunflower oil though, is that its consumption is made possible even at high temperature (since it contains more saturated acids) – while in its main form, it is not. The same approach applies for olive-based margarines – hydrogenation lowers the monounsaturated rate from 75 to 35%. Picking the right margarine will end up to be a real sport!… due to polyunsaturated/ unsaturated/ saturated alteration and omega3/6 ratio. When the frying-pan is used, always better to use olive oil or peanut oil. The more you higher temperature, the more an oil turns unfit for human consumption. Most of the oils should not be exposed to light/ air, and should be kept in fresh air (You should avoid the mayonnaise pots open during barbecues periods). Regarding frying oils, after 4 or 5 usage, they become unfit for human consumption (aka the lipoperoxydation). Most of the people are deficient in essential fatty acids. Omega 3 prevent cardiovascular diseases, enhance cellular exchanges, brain development and functioning. Colza oil should never be used above 180°c. Nut oil should only be used for cold preparations. Eat your omega 3 fatty fishes (mackerel, tuna, etc..). The same principle of cooking applies for fishes, above 180°c, you basically change the polyunsaturated chain. (a Tuna steak cooked at 250°c ends up to be useless when it comes to polyunsaturated properties). If your regimen prevents fishes consumption, I strongly advises EPA/ DHA supplementation (in fact, even if you eat your fishes). Simopoulos AP. The importance of the ratio of omega-6/omega-3 essential fatty acids. Biomed Pharmacother. 2002 Oct;56(8):365-79. ScienceDaily.com. Palm Oil Not A Healthy Substitute For Trans Fats, Study Finds. USDA/Agricultural Research Service, 2009. Grataroli R et al. Effects of dietary corn oil and salmon oil on lipids and prostaglandin E2 in rat gastric mucosa. Lipids. 1988 Jul;23(7):666-70. Annie Stuart. 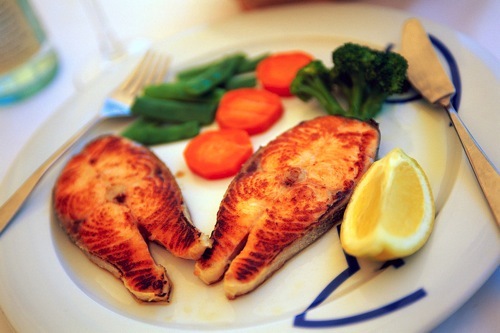 What to Know About Omega-3s and Fish. WebMD. Haag M. Essential fatty acids and the brain. Can J Psychiatry. 2003 Apr;48(3):195-203.